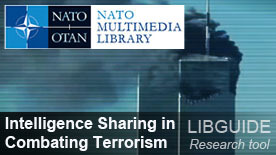 This LibGuide is intended to provide a few starting points to assist you with your research on issues related to intelligence sharing in fighting terrorism, in particular in the NATO context. "The product resulting from the collection, processing, integration, evaluation, analysis, and interpretation of available information concerning foreign nations, hostile or potentially hostile forces or elements, or areas of actual or potential operations. 2. The activities that result in the product. 3. The organizations engaged in such activities." Since 11 September 2001, NATO has sought to increase consultations on terrorism and terrorism-related issues among its members, as well as with non-member countries. Information-sharing and, more specifically, intelligence-sharing are key aspects of this exchange. (Source: Countering Terrorism NATO Topic page). Since 11 September 2001, NATO has sought to increase consultations on terrorism and terrorism-related issues among its members, as well as with non-member countries. Information-sharing and, more specifically, intelligence-sharing are key aspects of this exchange. At the 2002 Prague Summit, improved intelligence-sharing was identified as a key aspect of cooperation among Allies. A Terrorist Threat Intelligence Unit (TTIU) was set up under the NATO Office of Security at the end of 2003, replacing a temporary cell established immediately after the 11 September 2001 attacks. The TTIU functioned for the following seven years as a joint NATO body composed of officers from civilian and military intelligence agencies, having as its main task the assessment of the terrorist challenges, risks and threats to NATO and its member nations. To that end, the TTIU developed an efficient liaison mechanism with Allied intelligence services and national terrorism coordination centres. In addition, the TTIU shared terrorism-related information with partner nations. Based on the decision taken at the 2004 Istanbul Summit to review the intelligence structures at NATO Headquarters, connections with partner nations have been improved. In that regard, a new intelligence liaison cell was created at SHAPE in Mons, Belgium, and an Intelligence Liaison Unit (ILU) at NATO Headquarters in Brussels. Within the framework of the comprehensive intelligence reform at NATO Headquarters that took place in 2010-2011, the TTIU’s functions were taken over by the newly created Intelligence Unit (IU) and the establishment of the Intelligence Steering Board (ISB). That transformation further enhanced the analytical approaches on terrorism and its links with other transnational threats. The current mechanism has also enhanced cooperation among the NATO civilian and military intelligence components, and preserved the previously developed mechanisms that ensure coherent intelligence-sharing with partners. The joint civilian and military Intelligence Unit (IU) supports North Atlantic Council (NAC) deliberations and discussions on strategic issues of concern with intelligence-base analysis. The IU also supports senior civilian and military decision makers at NATO with intelligence-based analysis addressing identified subjects, including, but not restricted to: terrorism, instability, proliferation and other regional and transnational issues of concern for the Alliance. At the Warsaw Summit in July 2016, Heads of State and Government agreed to establish a new Joint Intelligence and Security Division (JISD), in order to improve NATO's ability to draw on a wide range of intelligence resources. (Source: NATO). As a result, on 21 October 2016, NATO appointed its first Assistant Secretary General for Intelligence and Security with the aim of improving intelligence collaboration within the Alliance. During their 15-16 February 2017 meeting in Brussels, NATO allied defence ministers decided to create a "new southern-oriented 'eyes-and-ears' hub in Naples" before the end of 2017. (Source: Defence Ministers agree on NATO Hub for the South, and Jane's Defence Weekly, 15 February 2017). This hub would facilitate the exchange and gathering of information "on important developments across our southern perimeter regarding the fight against terrorism. This is one of the key issues [that will come out of the ministers' meeting]." What is Intelligence? on the portal of the Office of the Director of National Intelligence (Washington D.C.), offers a very good definition of the concept, describes the different types of intelligence and their missions. Information Sharing with Non-NATO Entities, NATO Joint Analysis & Lessons Learned Center (JALLC) (13 November 2012). A "special relationship": bridging the NATO intelligence gap: a thesis by Wesley R. Curtis, Naval Postgraduate School, (June 2013). Trust (in) NATO - The future of intelligence sharing within the Alliance by Jan Ballast, NATO Defense College (September 2017). "Intelligence Sharing in NATO" by Joseph S. Gordon, in: Atlantisch Perspectiev, no. 6, 2017, p. 15-19 and "NATO Intelligence", in: Atlantisch Perspectiev, no. 6, 2017, p. 4-5 (available in print only).